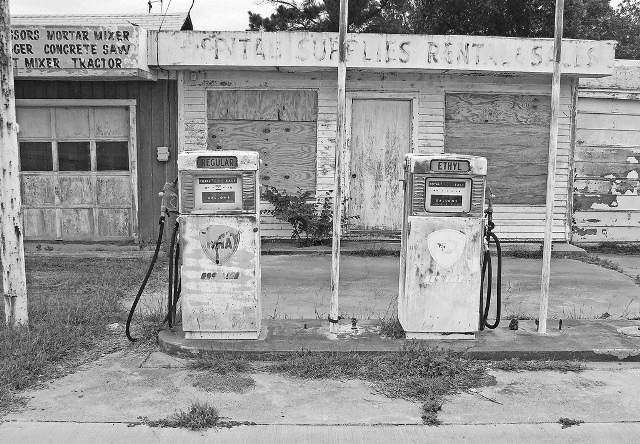 Savannah, Georgia, while on the road. We’re off for a week to Oregon to be with family. While we’re gone, feel free to sit a spell in the Square. More real soon. 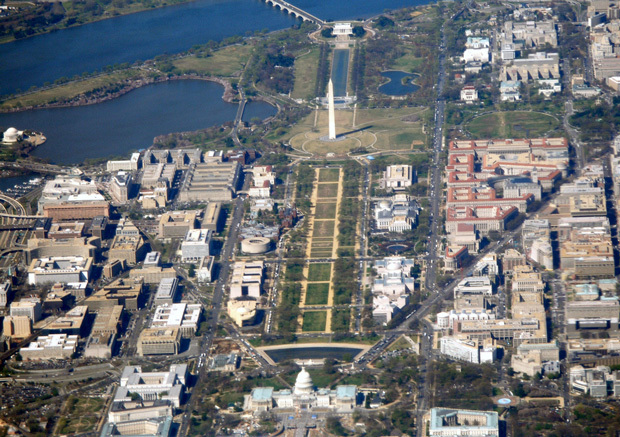 As we watch history unfolding yet again on the National Mall, we should remember the transformations of this vital space over the last two centuries. 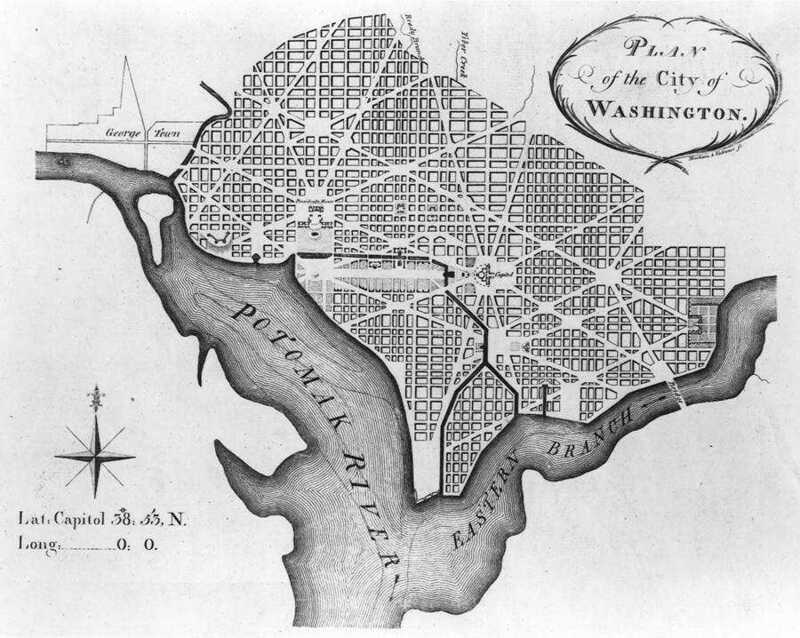 The Plan of Washington, Pierre Charles L’Enfant, 1791. 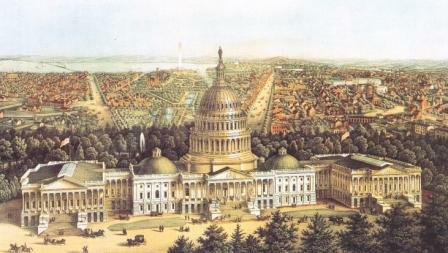 A view drawn shortly before 1885, when the Washington Monument was completed. A late nineteenth century view. 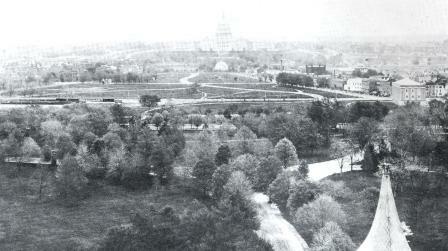 A view of the Mall in 1901. Note the train crossing the space. 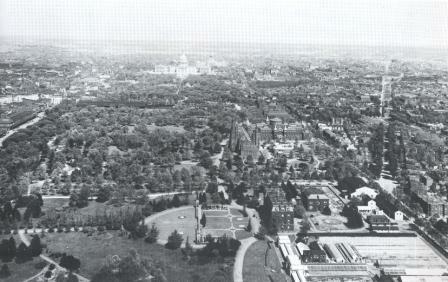 A view of the mall in 1901, from atop the Washington Monument. The McMillan Commission Plan, January, 1902. 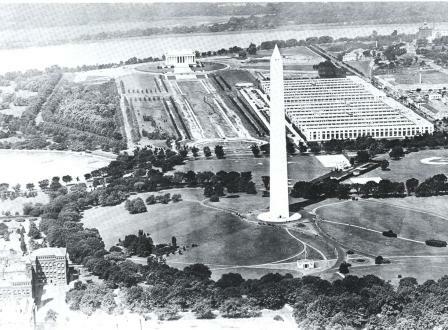 A mid 20th century view of the Mall. 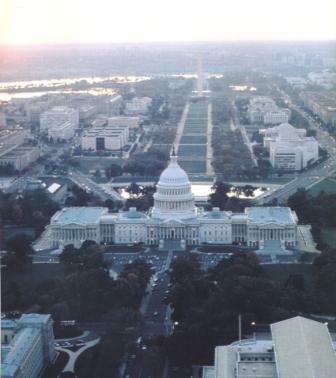 The Mall in the mid 1990s. As the new year begins, I am back to basics in urbanism and architecture. I have been spending some time doing research aimed at understanding the grid as an organizing device for cities. And the more I look into the use of orthogonal (right-angled) geometries as a way to structure urbanism, the more questions I seem to have. At first glance, nothing could be simpler than organizing a city using right angled lines. 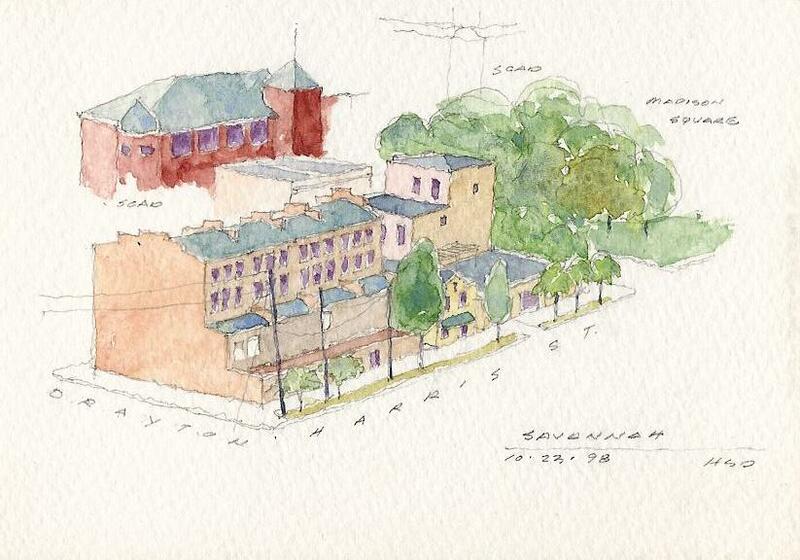 The lines form streets, or passageways, and the stuff between the lines becomes blocks for buildings. Seems clear and straightforward, so far: street, block, building. We can easily imagine cities organized this way, since so many of us live in places formed by grids. Take a look at Chicago, New York, Philadelphia, Portland, Barcelona. And even take a look at the ancient Ionian cities of Anatolia (Priene, Miletus), or the Roman Cardo and Decumanus: planning cities with grids has been around a very long time – thousands of years. Here in Washington, L’Enfant created a grid, and then bisected that grid with diagonal lines. The north/south grid is numbered or lettered, and the diagonal streets are named after states. (A waggish colleague once suggested that each state’s Senators should be required to live on the angled street named for their state – maybe this would insure Congressional representation for our fair city). Many think this confusing, but it’s nothing more than a gridded city with a twist. Beginning with the Public Land Survey System (sometimes called the American Rectangular Land Survey), first devised in 1784 and modified thereafter, a giant grid was laid across the nation. The purpose of this grid was to act as a method for subdividing the immense new country in preparation for settlement. Townships of 6 miles by 6 miles, with 36 Sections of one square mile (640 acres), and from thence to streets and blocks (or farms). Chicago’s 660′ by 330′ blocks are derived from this easy arithmetic: 128 blocks per square mile. At first glance, the grid itself seems like a neutral system, one without inherent meaning. Squares laid on the ground. What could be simpler? And less full of intent, or meaning. 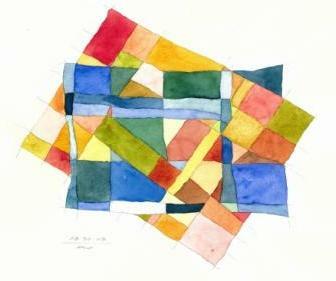 Just plain old squares. Or rectangles. Each orthogonal shape is the same as any other orthogonal shape. This grid planning approach seems mute – equality reigns throughout. Or does it? 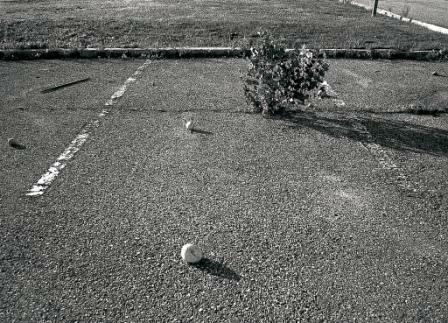 What’s puzzling is this: as soon as you set a grid on real soil, its neutrality vanishes. 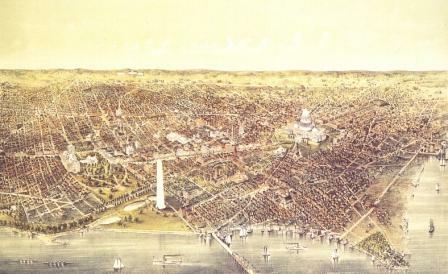 Topography, relationship to natural features like water or mountains, blocks reserved for public uses (in Chicago, the original 1830 survey set aside certain blocks for public uses such as schools), the creation of open spaces or public squares within the grid as in Savannah or Philly, all conspire to instantly convert neutrality into meaningful hierarchy. The three-part hierarchy of traditional cities – Civic, Public, Private – seems entirely comfortable, paradoxically, within a grid. Example: take a look at the 1909 Plan of Chicago by Daniel Burnham. The 1909 Plan of Chicago, by Daniel Burnham et. al. Burnham’s plan is clearly based on a grid. 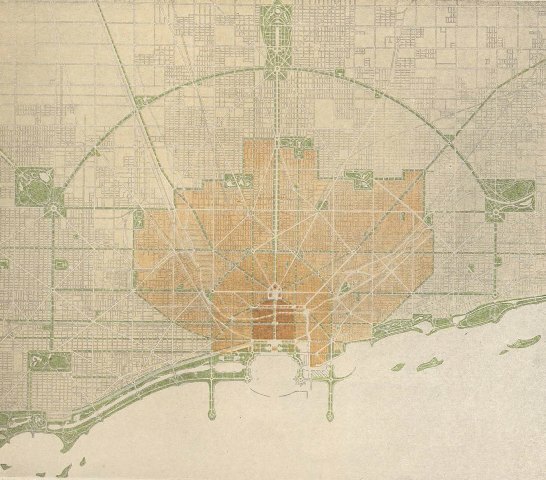 But just as clearly, this plan has a center – City Hall – and wings. Green spaces, a watery leading edge, a fade west into the prairie. Grid, yes, but one freighted with meaning, and hierarchy. Which brings us to an even more problematic matter. 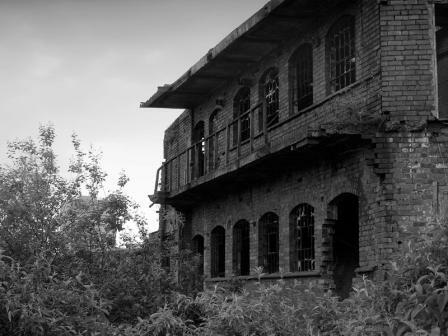 If the blocks are rectangular, there will be a long dimension and a short one, and the orientation of buildings to sun, wind, and rain should become an issue. But in Chicago, three quarter’s of the rectangular blocks are oriented with the long dimension running north and south (nothing like being on a large body of water). Manhattan is just the opposite – all blocks are long in the east/west (river to river). In the next city, how your building faces the sun and wind, daylight, rain and snow, will again become important. 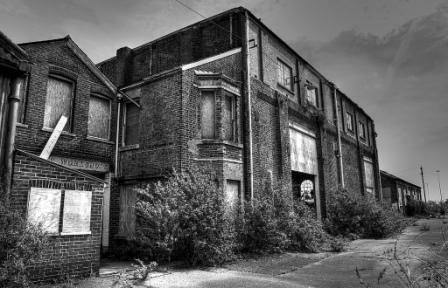 The front, sides, and backs of buildings will need to have different treatments (think of this – what an idea!) based on their ability to deal with capturing energy, managing water, offering daylight. It seemed so simple at first. Just a grid. But now we need to start tinkering with the grids of our cities, tuning them up to make them perform in ways that they never have before. On one hand, we want to conserve the idea that a gridded city paradoxically offers hierarchy, and meaning. 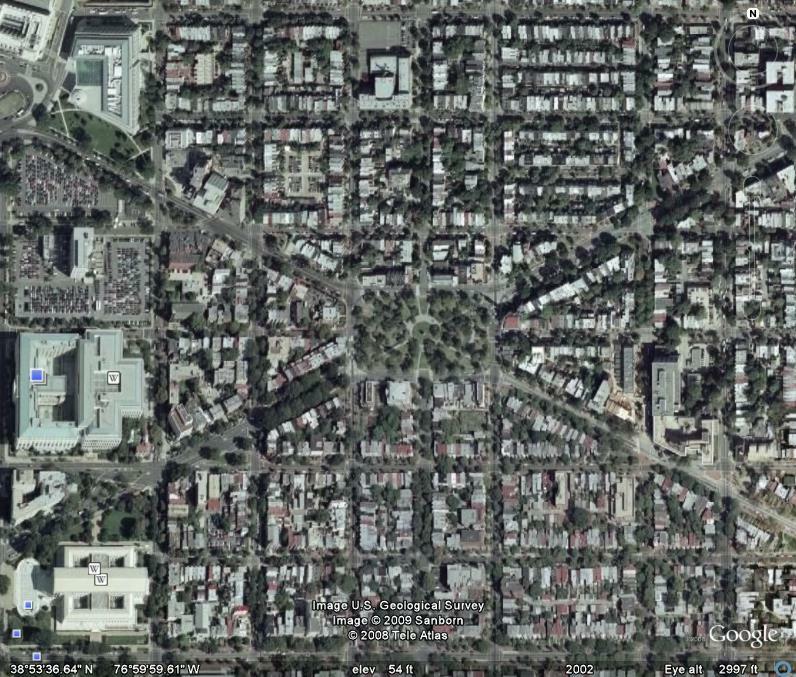 Some blocks in the grid are just more important than others, and for good reason, depending on the city we inhabit. But simultaneously, each gridded city must be restudied. What can we do to take advantage of the shape and form of our cities? How can we make them perform as they now must? Beyond a mere device for transferring property into private hands, or sheltering the Roman Legions, how can we make Chicago’s grid, or Barcelona’s, into a pattern that assures a sustainable, durable urban future? Time to unlock the grid.